Ken Burns’s first documentary, about the lives of rural Americans after the Revolutionary War — his student thesis at Hampshire College — ignited his interest in making films about history and helped launch his career. And it came about when the College created a production company for students to learn the craft by making films for local nonprofits and community organizations. One organization that called on Hampshire Films was Old Sturbridge Village, the living museum of rural New England in the early 1800s. And the rest is 40-plus years of the most watched documentaries about American history. “We got nonprofit companies to hire us at no wages to make documentaries at cost,” Burns recalled. “They got more or less semi-accomplished films they wouldn’t have been able to afford with commercial companies.” His thesis film, Working in Rural New England – called a Division III project at Hampshire because students complete three divisions as undergraduates – was made to educate visitors at Old Sturbridge Village. In 2018, Burns told Variety magazine that the museum approached Hampshire Films for a movie about people’s lives from 1790 through the 1830s — “basically right up to the point when New England started to get industrialized,” he said. The 27-minute film, completed in 1975 before Burns graduated, was also his first to be nominated for a national award: He was one of five students up for the American Society of Cinematographers award for best photographed college film of 1975. Burns remembers his thesis film in a new national PBS special Conversation With Ken Burns, a career retrospective interview airing in March, 2019, on PBS stations nationwide. Search local public TV schedules at www.pbs.org. Hampshire was founded by three Massachusetts colleges and UMass Amherst to reexamine the assumptions and practices of liberal arts education, and opened in 1970 to educate students to direct their own learning and perform serious independent work, mentored by faculty. In their final year, each student designs and completes an advanced independent study project, advised by a faculty committee. Burns enrolled in the College’s second class, in 1971. During his Division II in his second and third year of studies, for Hampshire Films, he worked on projects about child abuse for the local Children’s Protective Services and an appeal for blood donors for the Springfield chapter of the American Red Cross, which featured an appearance by the band Grand Funk Railroad, reports Gary Edgerton in his book Ken Burns's America. “We got to practice,” Burns said. “It made it possible for me to leave Hampshire and have the confidence to start my own company and not spend years mired in someone else’s vision.” Making the film, Burns told Variety, he learned how to write a proposal, manage a budget, shoot as a cinematographer, and edit. Directed and produced by Burns, Working in Rural New England was shot on 16mm using handheld cameras by Burns with classmates Kirk Simon and Terry Hopkins. Simon went on to become an Oscar- and Emmy-winning filmmaker and is recently deceased, while Hopkins has led an accomplished career as a cinematographer. The three also shared editing credit on the film. Watch Working in Rural New England on Hampshire College’s YouTube channel. The movie features long stretches of footage of Old Sturbridge Village museum’s reenactors depicting labor performed by post–Revolutionary War New Englanders, with occasional first-person narration from historical diaries. Men handle livestock, split wood, and husk corn; women bake, make cheese, operate a spinning wheel, and hand-wash clothes. There’s a potter, a blacksmith, a merchant, and a parson who works in a church while his wife leads a prayer meeting and sewing group. The film’s slight dramatic arc documents the transition of New Englanders from traditional rural skills, such as carding sheep wool by hand to weave fabric, after the Revolutionary War, to their lifestyle at the beginning of the industrial age. The film concludes with the opening of mills that powered large mechanical wool-carding machines and spurred a regional textile industry. Near the end of the film, Burns presents its only still image, a large painted mural of a 19th-century rural town that he invites the viewer to study closely using a slow, lingering pan left. Burns did not win that American Society of Cinematographers award for best photographed college film of 1975; it went to student cinematographer Philip Earl Jr., of the University of Southern California Department of Cinema, at a gala dinner in Hollywood. Burns and the four other nominees received plaques of achievement, according to the ASC press release. According to Gary Edgerton, in Ken Burns’s America, the film did win an award from the National Historic Preservation Trust. A year after graduation, Burns founded his first production company, Florentine Films, with two college friends, Roger Sherman and Buddy Squires. He said his thesis helped him raise funds to direct what would become his first feature-length documentary, Brooklyn Bridge, based on Pulitzer Prize–winning historian David McCullough’s book The Great Bridge. He produced Brooklyn Bridge with Sherman, Squires, and Amy Stechler, who would become his first wife. 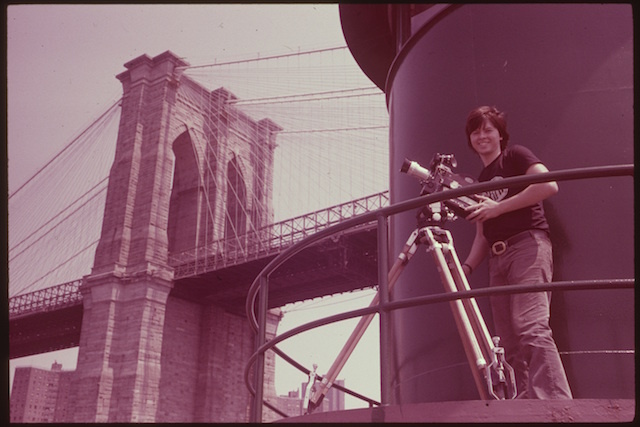 To make Brooklyn Bridge, they raised funding from the New York Humanities Council, the National Endowment for the Humanities, and a dozen other public and private groups. The documentary was nominated for an Academy Award in 1981, propelling filmmaking careers for Burns and his classmates. Stechler co-produced, wrote, and edited ensuing films with Ken, namely The Shakers and Huey Long; served as a consultant for The Civil War; and went on to direct the PBS documentary, The Life and Times of Frida Kahlo. Sherman has led a career as an award-winning director, producer, cinematographer, photographer and author. Squires is an accomplished cinematographer of Academy- and Emmy-award winning films. 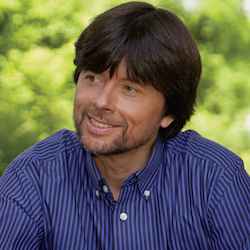 To date, Ken Burns’s films have been recognized with a slew of Emmys, Oscar nominations, and Peabody Awards. He has received more than 25 honorary degrees and delivered many commencement addresses. In 2008, he was honored by the Academy of Television Arts and Sciences with a Lifetime Achievement Award. His films have ranged in length from an hour to more than 18 hours. Among his most-watched titles: His epic 10-episode The Vietnam War seen by 39 million viewers during its TV premiere in fall 2017; Baseball, viewed by 43 million in its premiere; The Civil War, 39 million; and The War, about World War II, by 38 million. PBS is beginning to promote his new series, Country Music, to premiere nationwide in September. He recently launched the website Unum, which enables users to navigate it based on a time period or a theme and to watch clips of his documentaries on various American history topics. Over the years, Burns has maintained relationship with both Hampshire College and Old Sturbridge Village. For his alma mater, he has served on the board of trustees, been a major donor, spoken at a few Commencements, hired and mentored Hampshire alums and interns, and participated in many campus events. For Old Sturbridge Village, Burns regularly hosts a major fund-raising gala and presents the annual Ken Burns Lifetime Achievement Award, honoring an individual who has made a significant contribution to the preservation of history through the arts. Among recipients have been Cokie Roberts, John Williams, Tom Brokaw, Sam Waterston, Doris Kearns Goodwin, Laura Linney, and Norm Abram. He has also hosted PSAs for the museum. Burns currently has a 15-year contract with PBS, set to end in 2022. He’s producing or developing films on Ernest Hemingway, Muhammad Ali, the Holocaust and the United States, Benjamin Franklin, Lyndon B. Johnson, the American buffalo, Leonardo da Vinci, the American Revolution, the history of crime and punishment in America, the history of Reconstruction, and Winston Churchill. Ken Burns and Panelists "On the Public Intellectual," Hampshire College, Sunday, June 21, 4-6 P.M.
Ken Burns and panelists will speak on "On the Public Intellectual" at Hampshire College, June 21.